This is my review of the American Airlines lounge in Heathrow Terminal 3. I decided to visit them all! Having started off with the two third-party lounges (No 1 Traveller – outstanding, Swissport – dreadful) I moved on to the oneworld options. 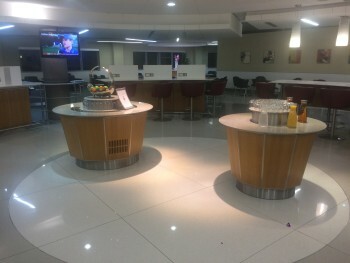 I reviewed the British Airways lounge in Terminal 3 here. I had planned to review the Cathay Pacific lounge as well, but I didn’t know when I visited that it was about to close for refurbishment. As it is now shut – I was one of the last people to visit, it seems! – there is no point wasting pixels on it. This leaves the American Airlines lounge. 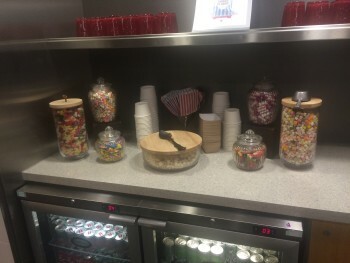 I had heard some fairly positive things about this lounge – no-one is ever going to rave about an American Airlines lounge, of course, but the buzz about this was not too bad. I was therefore a little surprised with what I found. You need to remember that I was there at 5.30pm in the afternoon which appears to be a lull in the AA schedule. The reception area is very smart indeed. 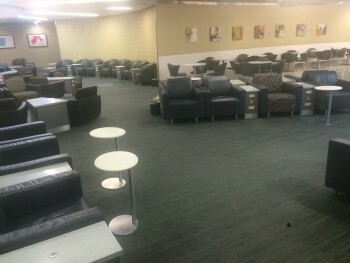 I get a feeling that it has been refurbished far more recently than the lounge itself. 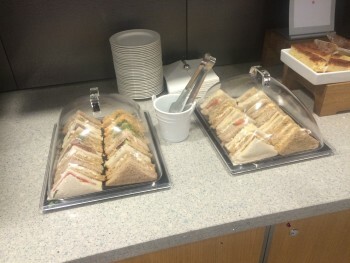 … and some sandwiches …. I don’t have a photograph of the self-service bar. It was nothing to write home about – I didn’t see champagne in any of the lounges I visited (it would have been in the First Class section of the BA lounge) although the now-closed Cathay lounge did have prosecco. What AA did have was sweets! It also had a large number of computers for your use (although BA had more) and the usual terrible ‘only there because they paid us’ selection of magazines. 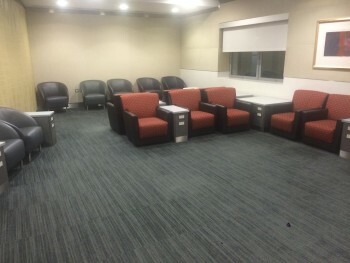 It is difficult to write about a lounge when you are the only guest – there were no staff either. Just me and this big space. It was a bit spooky! It gave me too much time to consider the state of the furnishings, which were frankly pathetic and look as it they escaped from the reception area of a 1970’s office block. I am guessing (well, hoping) that the lounge comes to life in the early evening with decent food and a few other guests. I can’t recommend visiting at 5.30pm, however …. From my tour of Terminal 3, the clear winner in the lounge stakes is No 1 Traveller. You can access with a Priority Pass or buy access via their website. 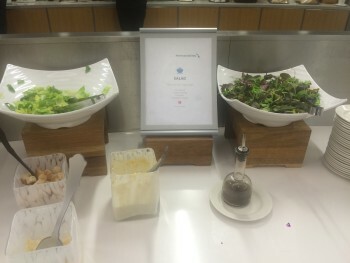 Of the oneworld airline lounges, British Airways is the best of an uninspiring bunch. I am hoping to visit the Virgin Clubhouse in Terminal 3 in 2016, which is somewhere I haven’t visited this century. It is time I paid it a visit again. 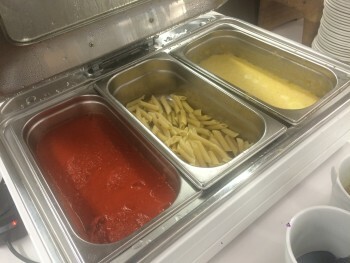 Bits: Black Friday deals already launched, my first hotel pancake machine! These pictures did shock me a little. The Flagship lounge though on the other side is really quite nice. More modern interior, smaller obviously and when I’ve been in it (usually for a morning departure to the US) busy but not overly so. The made to order breakfast (scrambled eggs with avocado if I remember correctly) was actually yummy. Thanks as always for the review. I’m curious though… if the CX lounge hadn’t closed, where would you have rated / placed it? Also, second question, do you (or any readers) know which is the best T3 lounge for a (newly attained) BA Gold and their BA silver wife?? I used to love the CX (good magazine selection there too! ), so was planning to try “CX First”, but that plan has been blown out of the water. Is BA First (or whatever it’s called) my best option now, or does Admirals Flagship stack up well? It wasn’t hugely impressive. Below BA (purely based on facilities), above AA. 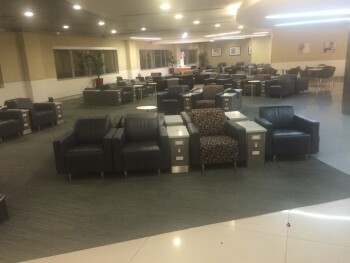 Does anyone know if the Emirates lounge at T3 has now reopened, and if it has a dedicated First Class area now ? I did the first review on it a few weeks ago! No F area. Did you do the Finnair A350 review yet? I’ve searched around on your site but can’t see it …. No, had to get the lounge reviews done first! Will be very soon as I adament it will be done before I head off to the Middle East on the next review trip on Thursday!